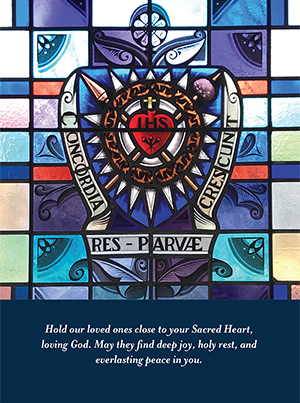 The Sacred Heart Union of the Xaverian Brothers is an association of Brothers, benefactors, Xaverian Associates, and friends who daily remember the names of those enrolled in the Sacred Heart Union. Those enrolled in the Sacred Heart Union enjoy the spiritual benefits and good works of the Xaverian Brothers around the world. Masses are offered regularly at Xaverian House in Danvers, Massachusetts and Ryken House in Louisville, Kentucky for the intentions of those enrolled in the Sacred Heart Union, whether living or deceased. 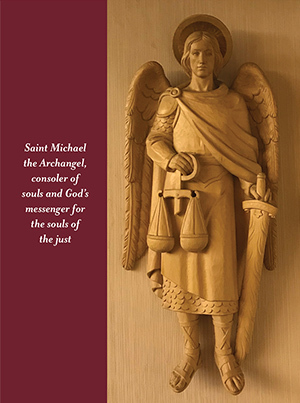 In addition, the Brothers around the world remember the members of the Sacred Heart Union in their morning and evening prayers, while praying the rosary and performing other spiritual practices. For a suggested donation, enrollment cards can be obtained for Perpetual Enrollment of deceased in the Sacred Heart Union, or for Annual Remembrance of deceased. Cards are also available for special occasion or for healing prayers for loved ones or friends.